The sketchbook is a special place for an artist. It’s like a playground—a place where they can try out new techniques, imagery, and generate new ideas and ways of working. The pages can even offer a place to emotionally heal. 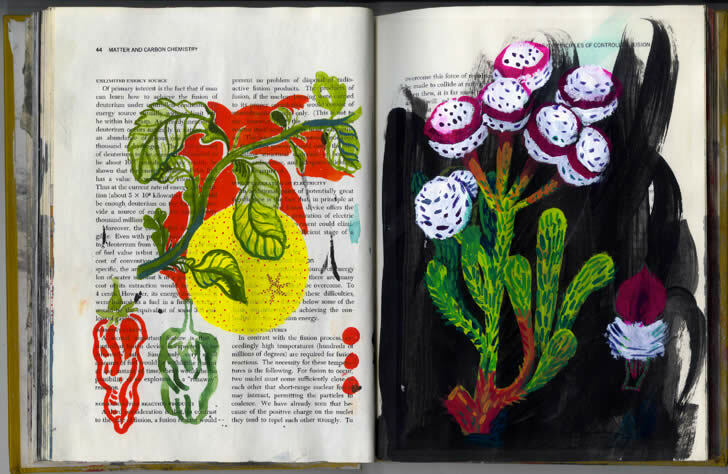 The work done in a sketchbook is often incorporated into an artist’s larger, more finalized pieces—treated like scratch paper—but that’s not always the case. 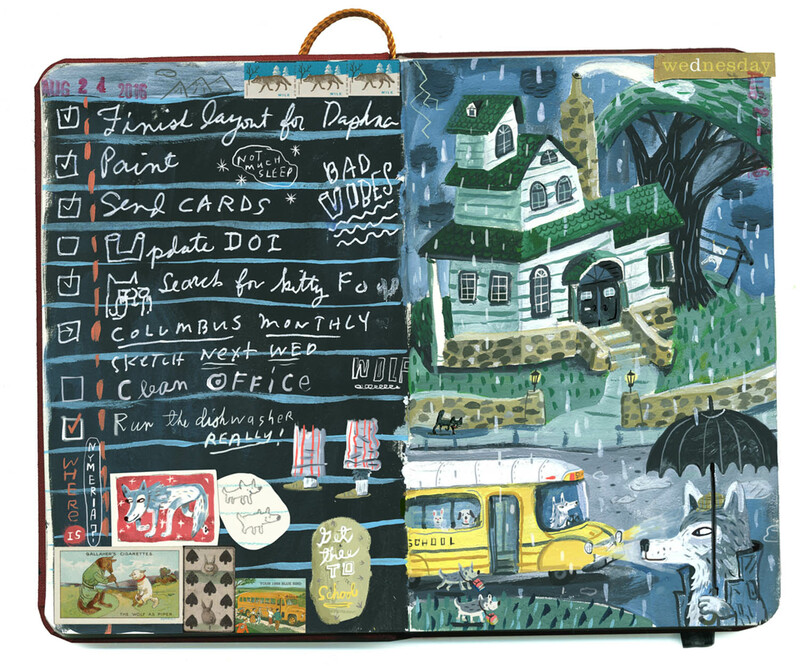 Sometimes, the journal itself is its own artwork, with each spread being its own drawing or painting. In this way, the sketchbook is a mobile gallery that can house pieces that are as refined as ones that would hang on the wall. 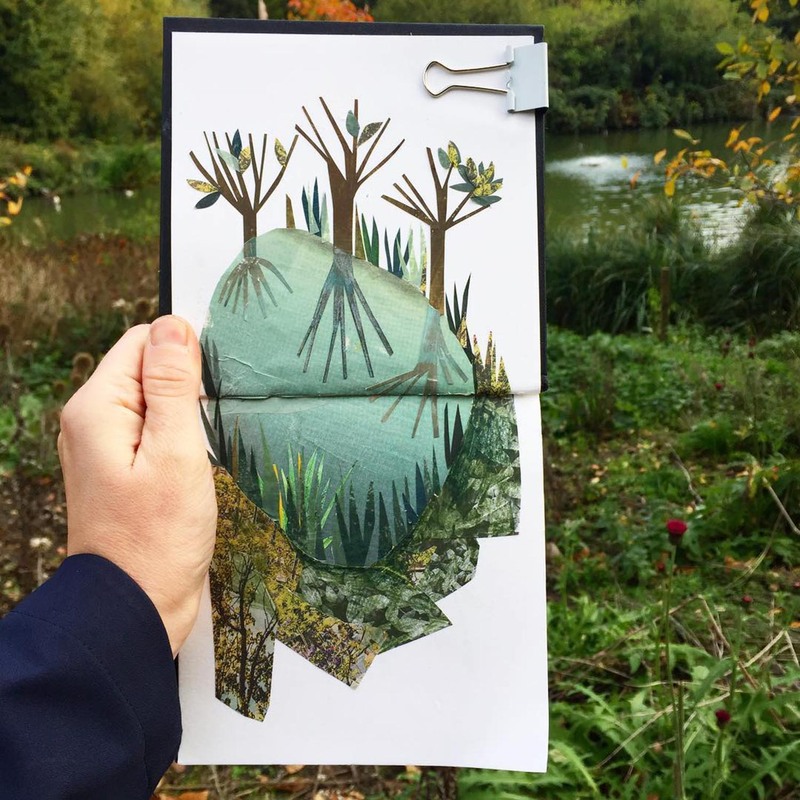 These are 10 artists working almost exclusively in their sketchbook and proving that it’s more than just notes or scribbles. 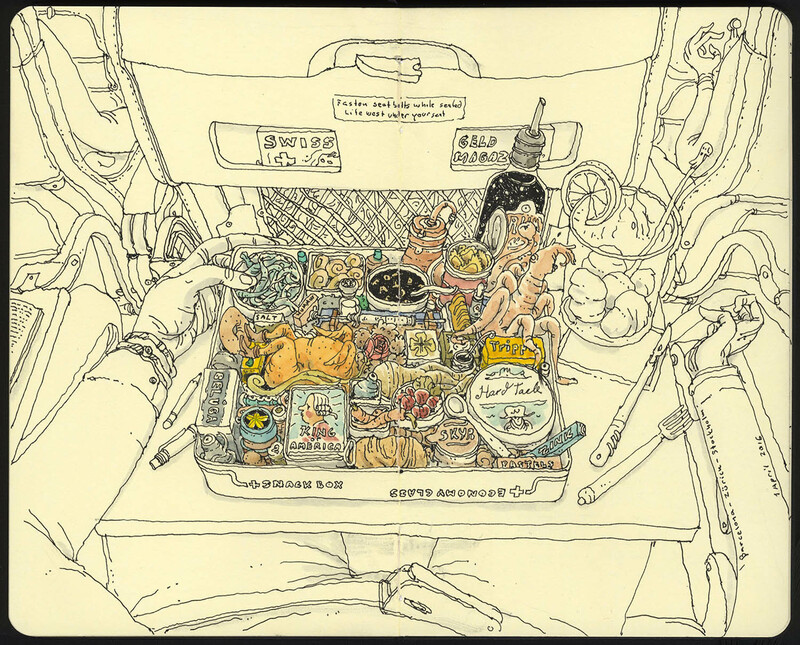 One of the many elaborate drawings from Mattias Adolfsson’s 2016 travel sketchbook. 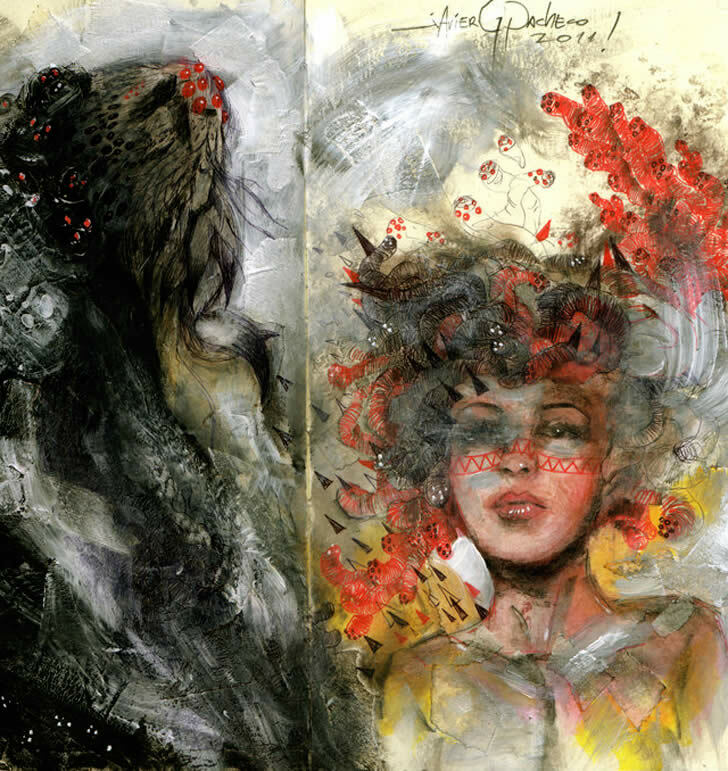 Samantha Russo’s sketchbook paintings changed dramatically during an extended art project. 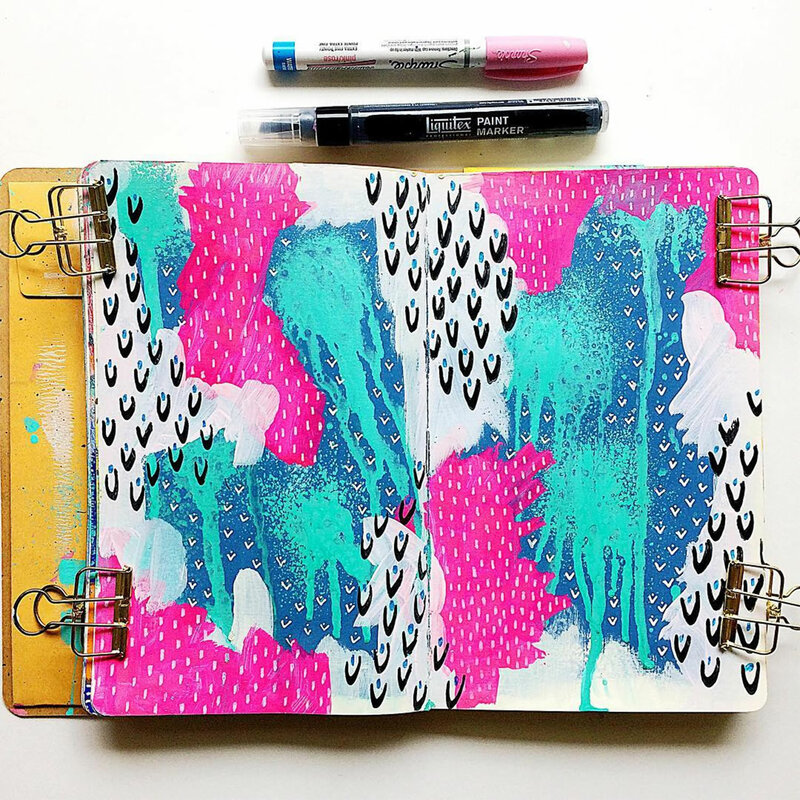 Samantha Russo is a self-proclaimed “color junkie” who fills the pages of her sketchbook with vibrant hues and a mashup of pattern and texture. 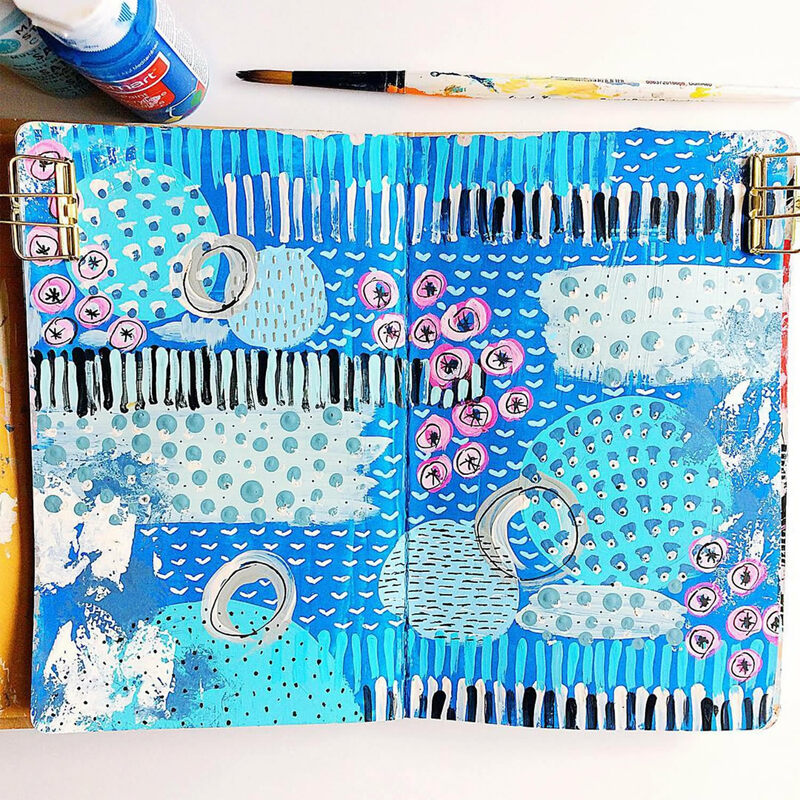 In the course of several months, her artistic style in her journal has shifted—it started as tight drawings of nature, and eventually progressed into wild abstract spreads. This is thanks to her #100dayproject which has undoubtedly loosened her art making and led to some of her best work so far. Clover Robin takes her collage supplies with her while traveling. 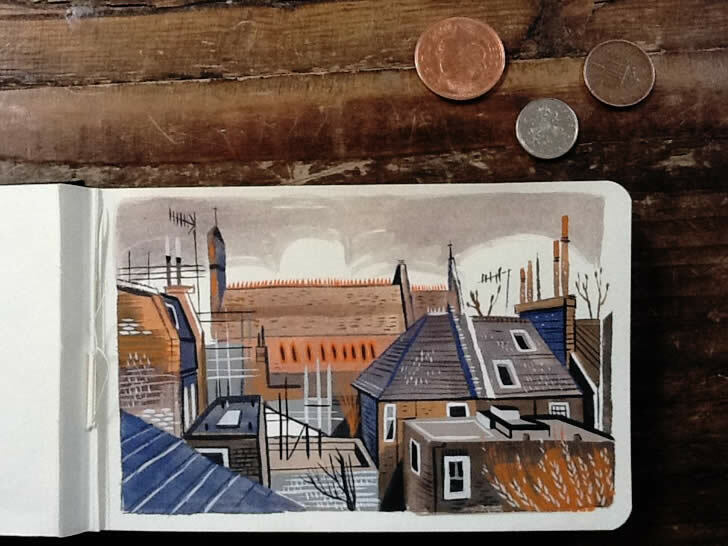 Many artists who sketch on-the-go use a pen or pencil to record their surroundings—but not illustrator Clover Robin. 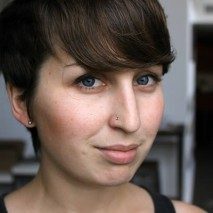 She opts for paper, scissors, and glue to create collage cutouts of forests, trees, and the desert. 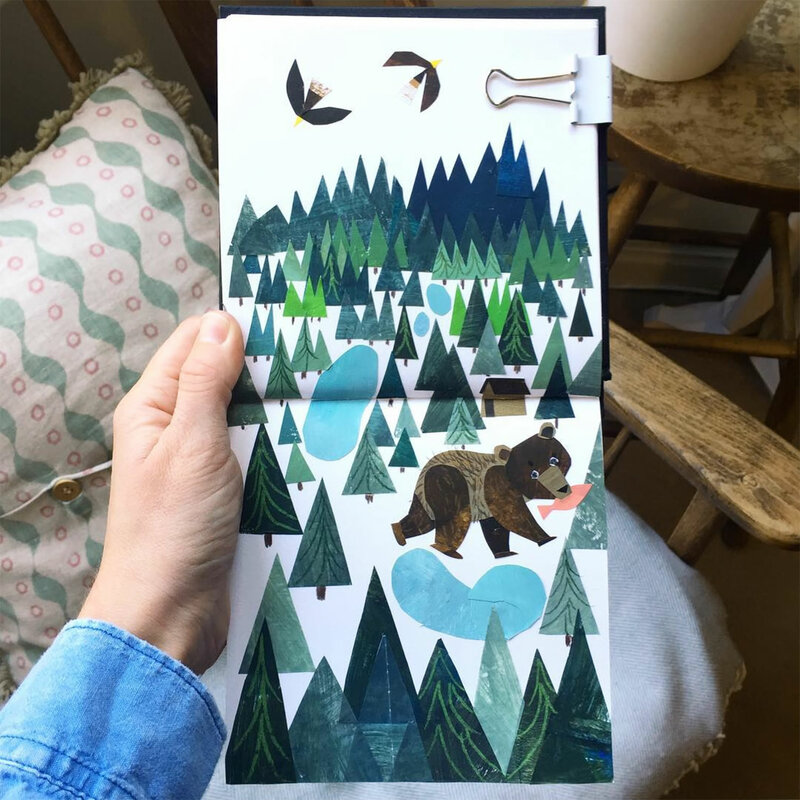 Robin’s sketchbook (and accompanying supplies) go with her across the ocean; the London-based creative recently brought her tools with her on a road trip in Canada and the US. 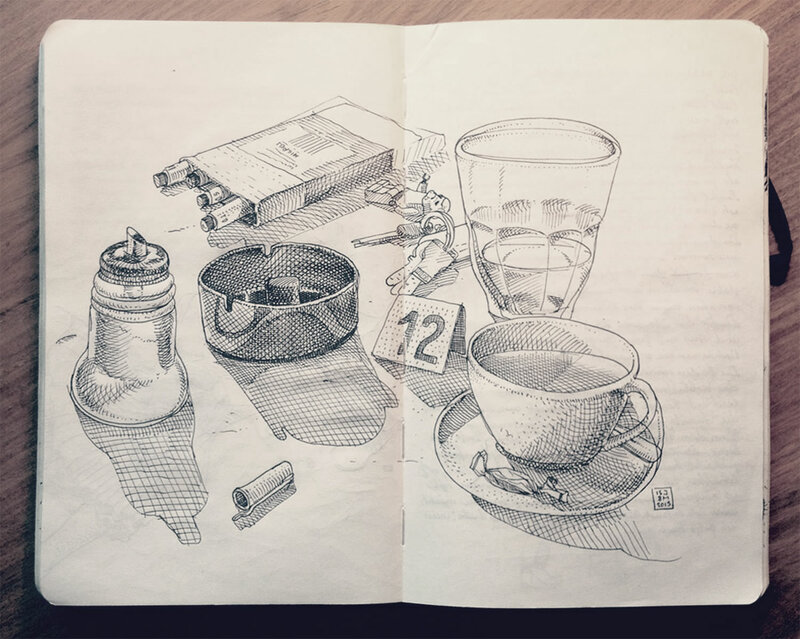 Thomas Cian uses a mashup technique when drawing in his sketchbook. Thomas Cian spent a considerable amount of time traveling in 2015—two weeks in Hong Kong and one month in Malaysia—during this period, he produced a myraid of observational sketches. 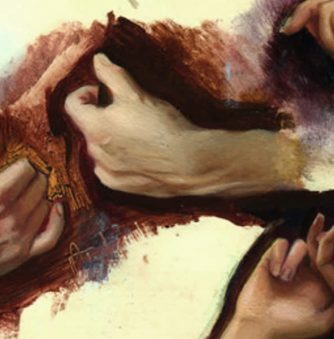 The slice-of-life drawings are partially representational (and highly rendered) while other sections of a composition are left with little detail. 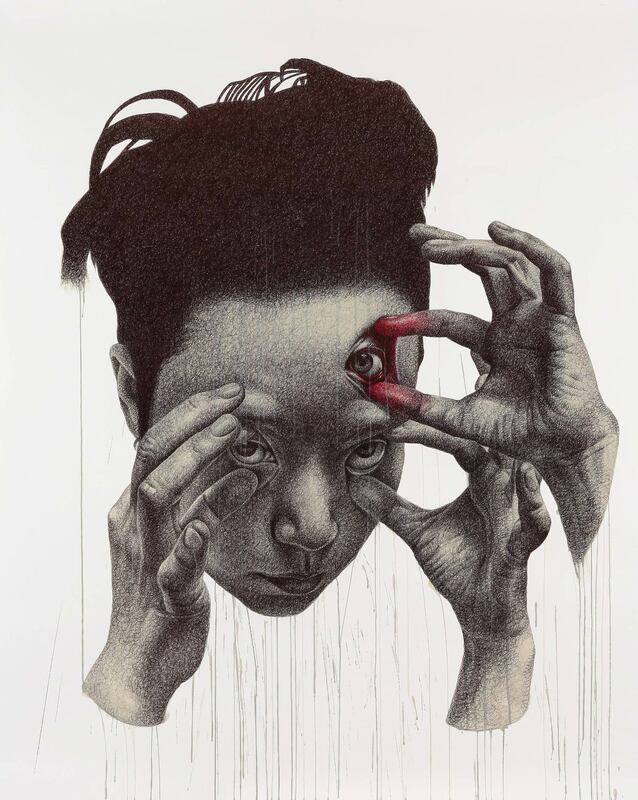 His most compelling works are ones that are mashups and combine different people, places, and things into one spread. 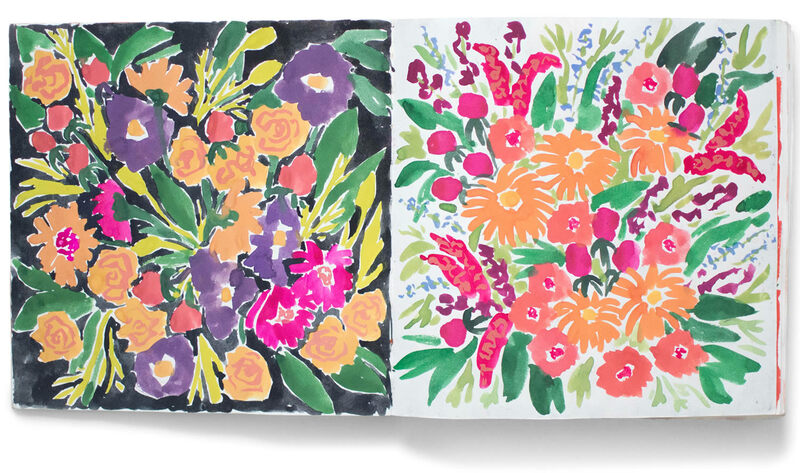 Leah Reena Goren sketches with paint. 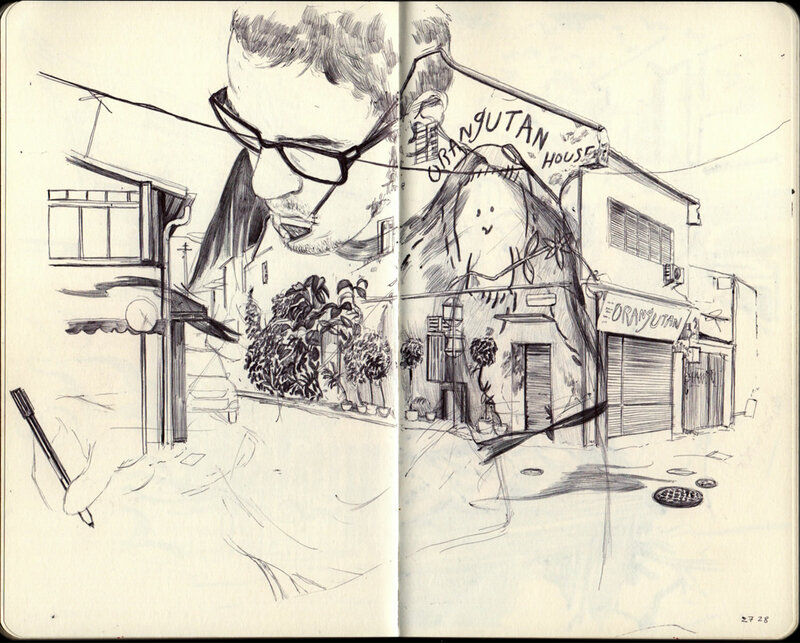 Leah Reena Goren has made her sketchbook an integral part of her illustration career. Often, images that appear in editorial illustrations are plucked from the pages of her sketchbook, refined and cropped before being published. 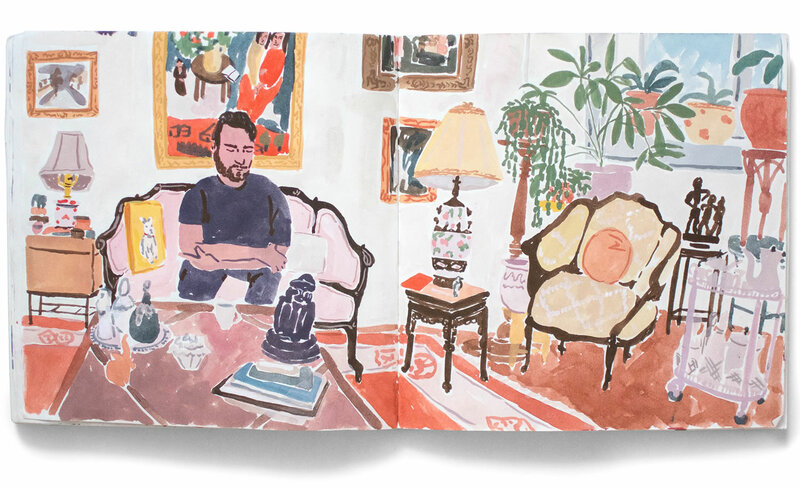 Goren, along with illustrators Julia Rothman and Rachael Cole, are the authors of “Ladies Drawing Night,” a book that’s revolves around sketching and drawing with friends. 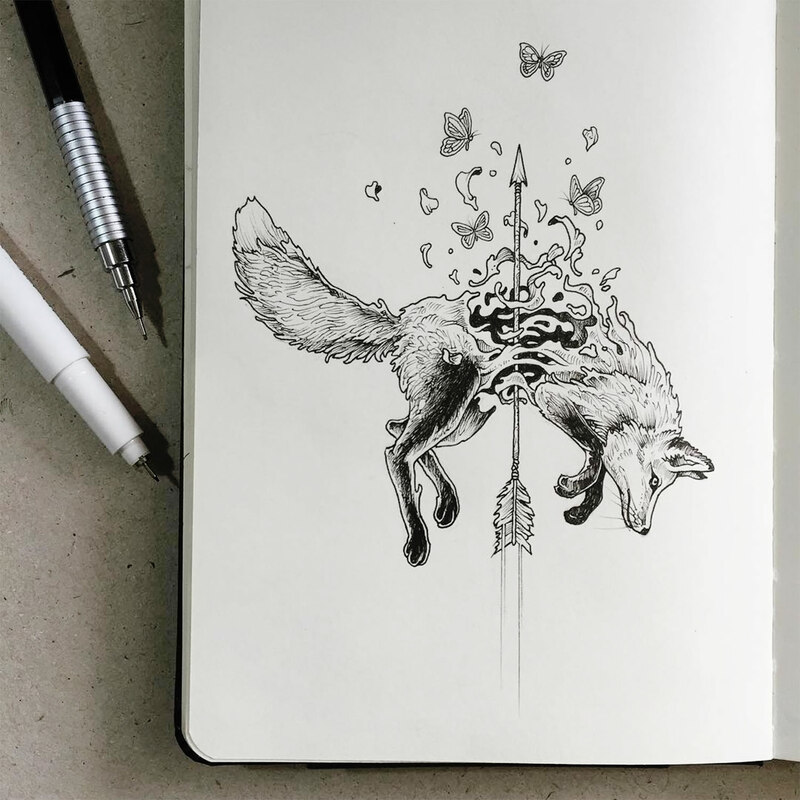 Kerby Rosanes’ busy illustrations lend themselves well to adult coloring books. 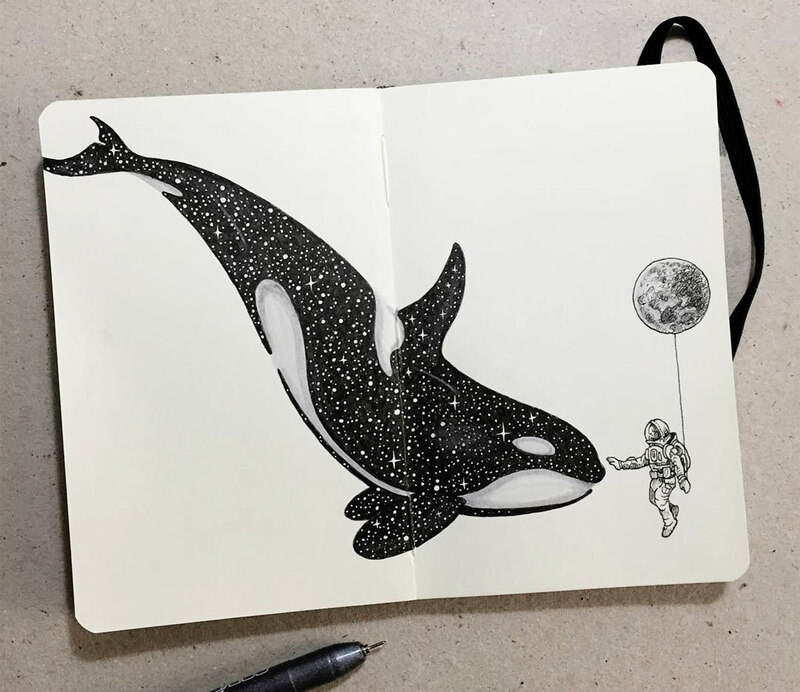 Based in the Philippines, Kerby Rosanes was a trained as a graphic designer (and started his career as one) before giving it up to pursue his “Sketchy Stories.” His intricate compositions in beloved Moleskine journals feature a number subjects that fold into one another and seemingly change forms right on the page. 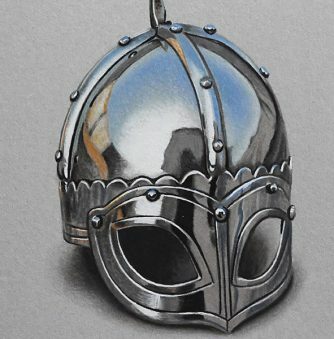 His drawings have been made into several books—including ones you can color. 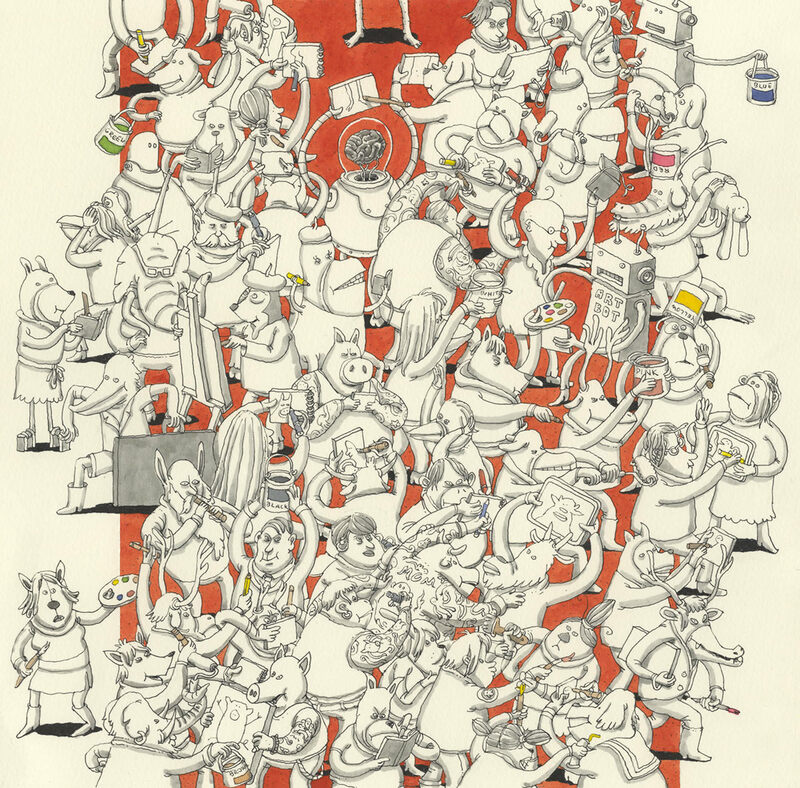 Mattias Adolfsson often draws his family, but avoids his teenage daughters. 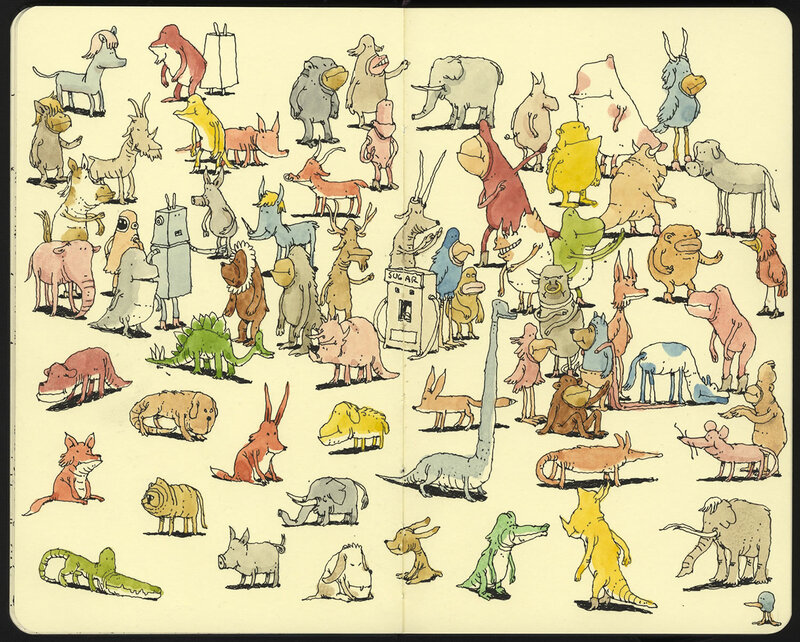 “I’m not sure that I always wanted to be an artist in my childhood,” Mattias Adolfsson told Hi-Fructose, “I wanted to be an archaeology or something that involved history.” It seems fitting that he would express himself in sketchbooks, which are filled with detailed drawings of people, places, and things. Adolfsson is some sort of conduit for the strange worlds depicted on pages. 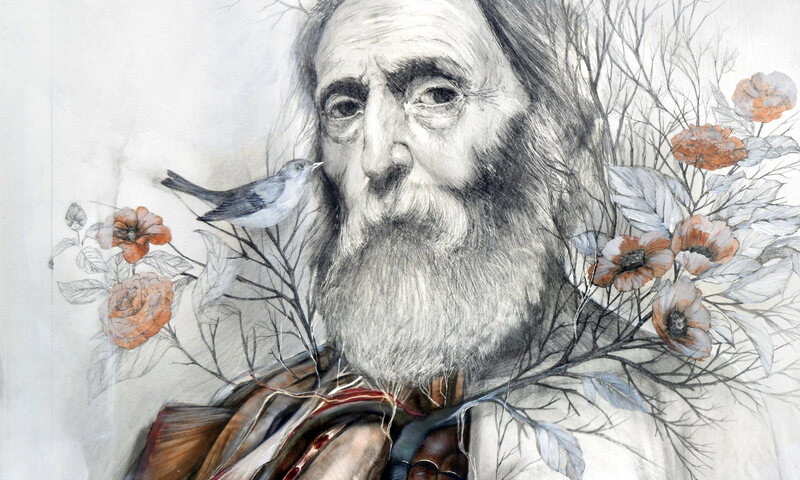 Birdsong has her life contained in her sketchbook. 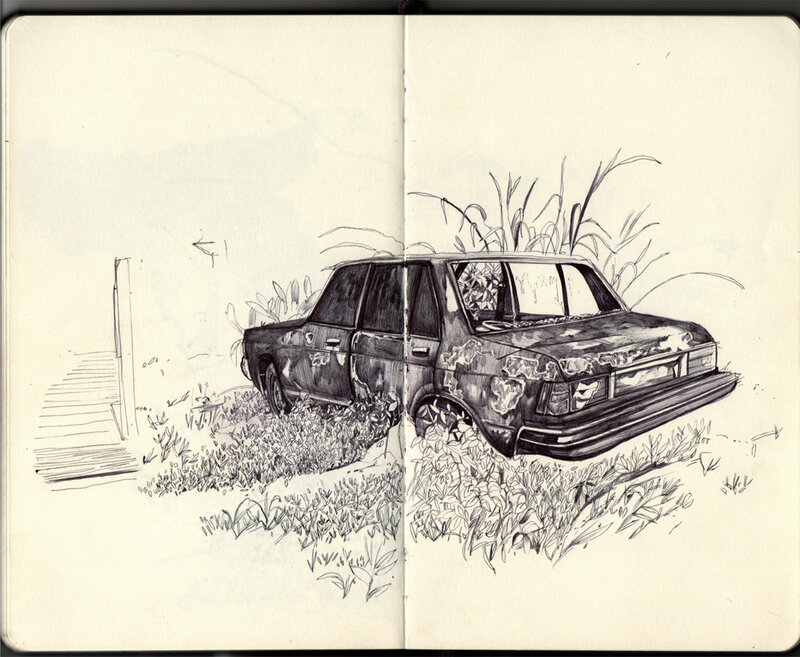 Stephanie Birdsong draws in her sketchbook every day. 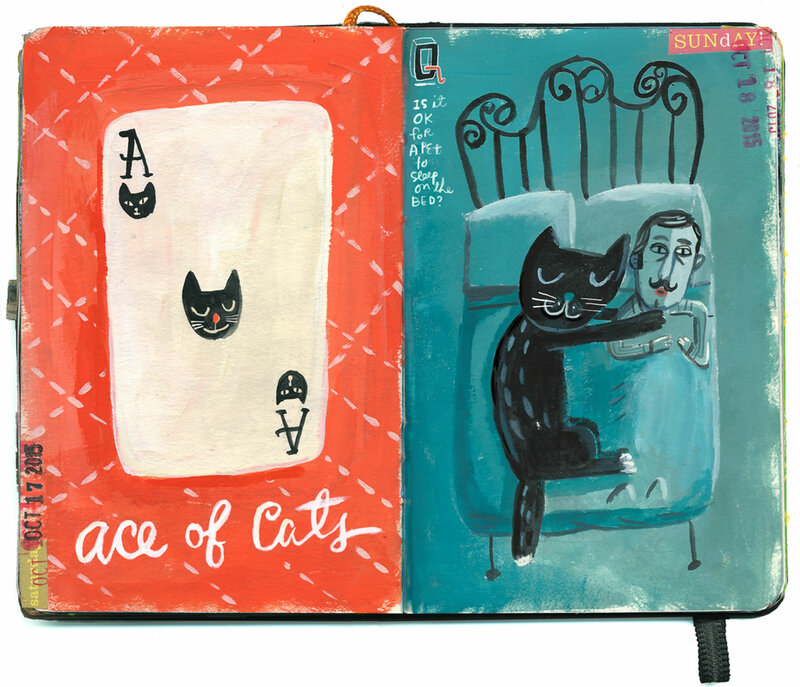 Part illustration and part visual diary, her books contain completed paintings, to-do lists, and collage ephemera. 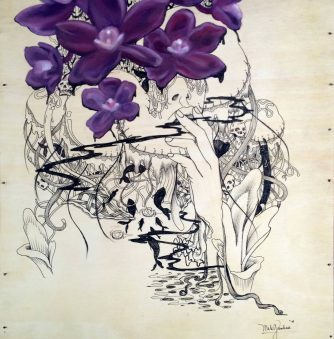 Despite these disparate elements, the compositions feel cohesive and offer a valuable insight into her daily life and allow us to draw connections between what she’s thinking about and her illustrative work. There is no separation—the two go hand-in-hand. 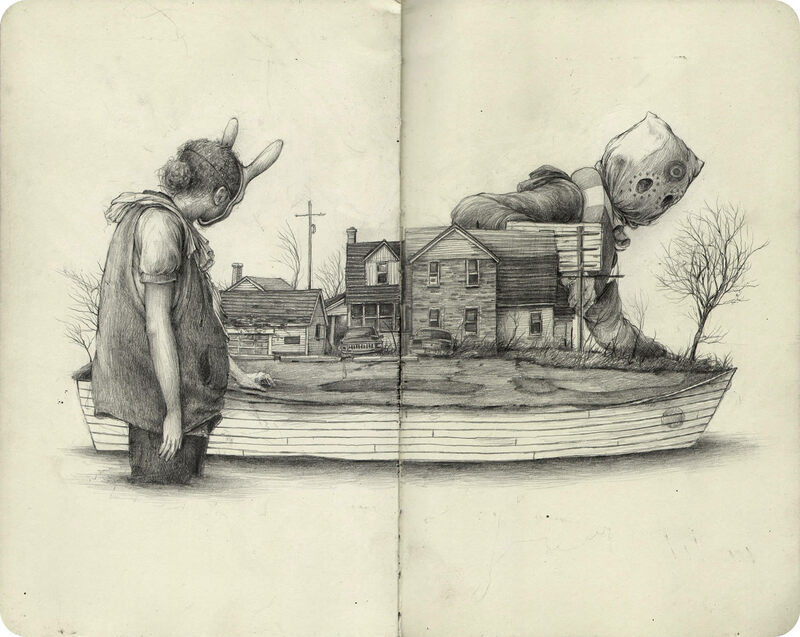 Pat Perry mixes fantasy and reality within his sketchbook spreads. Pat Perry creates his drawings through careful observations, but he does take some liberties when it comes to his sketchbooks. Through his highly-rendered compositions, Perry places characters in fantastical situations—they’re larger than life, hovering above buildings or wearing strange attire. Based in Detroit, his latest series of sketches take place in New Orleans and include some journal-like passages that read like a stream of consciousnesses. 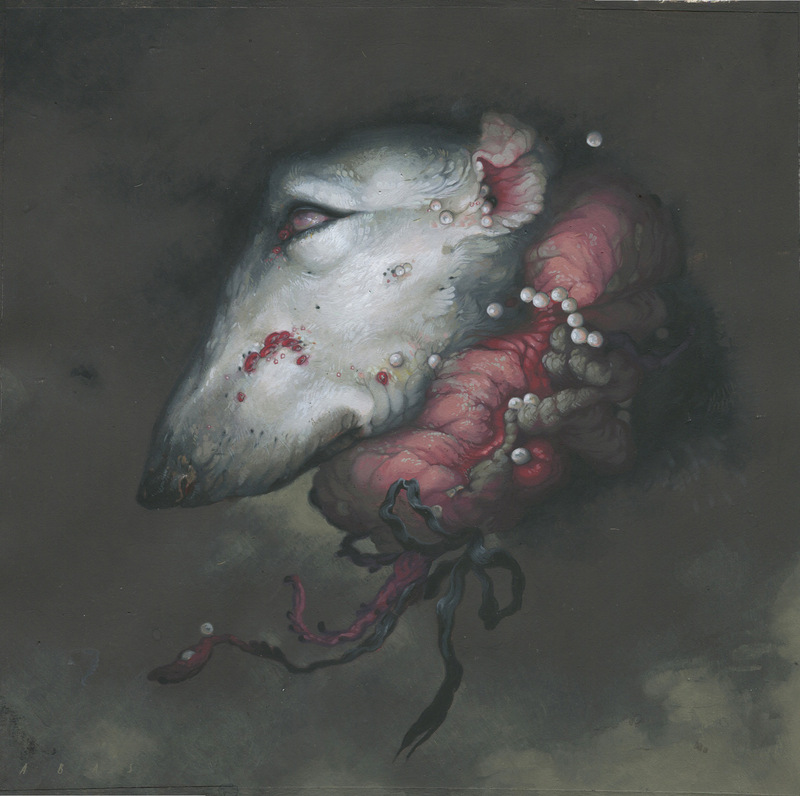 Jared Muralt sells his sketchbooks from as far back as 2011. 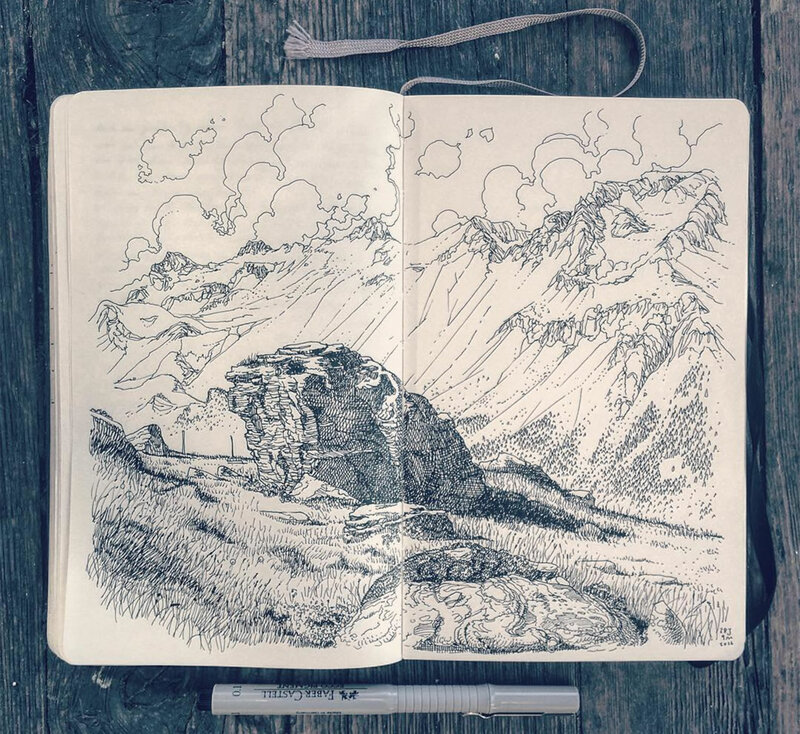 Illustrator Jared Muralt uses a sketchbook for what is typically associated with—studies and planning of future art pieces. In his case, these are larger drawings and comics, but Muralt’s art in his Moleskine stands on its own as something that could be framed. 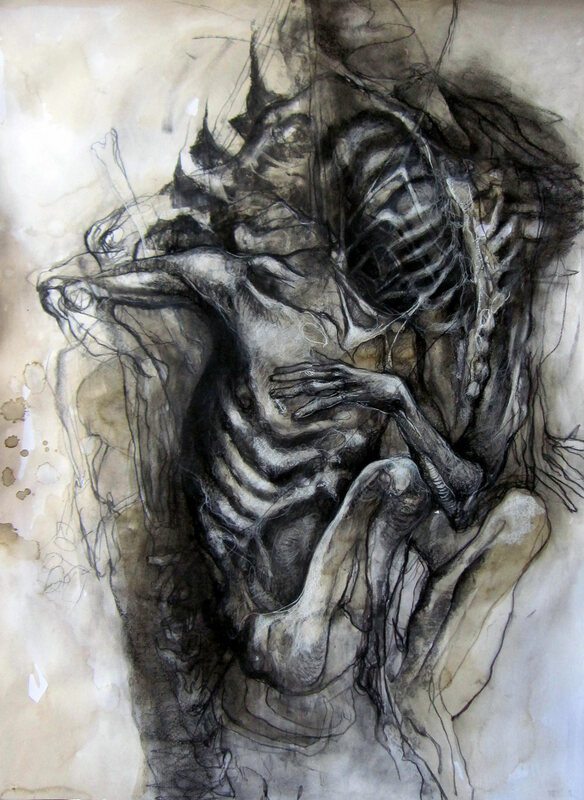 Muralt sells copies of his sketchbooks (from several years past) through his online shop. 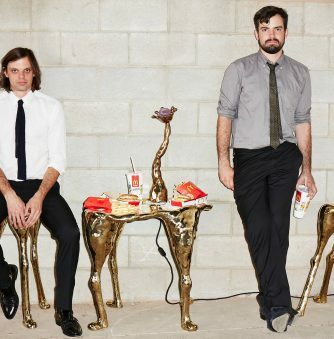 They are presented alongside fully realized drawings and diary entries. Kelogsloops’ 2016 watercolor sketches are a continuation of his 2015 project. 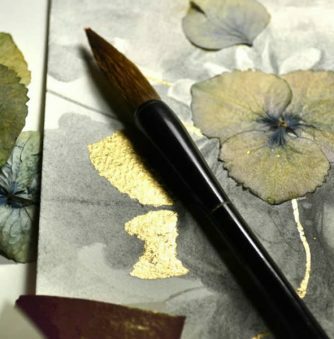 Hieu, aka Kelogsloops, began a watercolor sketchbook in 2015 as a way to learn the craft. “I set a goal to improve my watercolor work, become comfortable with it and no longer fear it,” he told Atrum People. Continuing, “Fast forward to the end of 2015, I’d say it was one of the most rewarding projects I’ve ever done.” Since then, he has stuck with this way of working, garnering a massive following on Instagram with videos of his tedious process.